a) The closing date for ALL entries is 5pm on 27th January 2019. Any entries received after this date may be allowed at the discretion of the Committee. No entry will be accepted until the correct entry fee has been received. Candidates who wish to withdraw their Festival entry must inform the Entry Secretary in writing at least 2 weeks before the Festival. Entry fees will only be refunded if the notice period is adhered to. c) Times will be negotiated and confirmed by e-mail or other methods by arrangement. d) All cheques should be made payable to “Weymouth Music Festival”. e) Each class has a maximum number of entries available and the places will be allocated on a first come, first served basis. Anyone applying for an entry after this will be contacted by the Entry Secretary and either offered a place on a waiting list or their entry money returned. a) All children aged 14 or under must be accompanied by a responsible adult. The committee does not accept responsibility for the supervision of children and vulnerable adults in any area of St Aldhelm’s Church & Centre during the Weymouth & Dorset Music Festival. This is the responsibility of the parents, guardians and carers. b) Copies of the Child Protection Policy will be available on the day and can be found on the door of each performance room and at the Reception desk. Entrants are expected to provide their own accompanists or provide a backing track with a portable playing device. The Festival may be able to help in finding an accompanist if notified at least 2 weeks in advance. 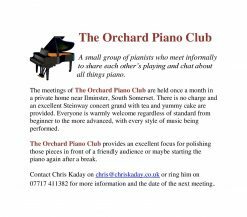 There will be a fee of £10 payable if you use an accompanist supplied by the Festival. Please arrive at least 15 minutes before your class and register with the Secretary. a) Solo and duet entrants are to perform a programme of a maximum of two pieces of their own choice. Beginners are allocated 3-5 minutes in total, intermediate players – 5-8 minutes, advanced players – 8-10 minutes. No piece should exceed 5 minutes in length. Groups will be allocated 10-15 minutes and may perform up to 3 pieces. Extra setting up time will be allowed for large instrumental groups. Entrants may be timed and the adjudicator informed if they exceed the time allowed. the steward the titles of the music they are performing, and a legible copy of each piece of music for the adjudicator. c) No photocopy or other copy of published music may be used without the publisher’s written permission. One photocopy may be made for the use of the adjudicator provided that the entrant has already purchased his or her own copy. The copies must be presented in book form rather than a series of separate sheets. The copy made is retained by the adjudicator and destroyed immediately after the Festival. Please note that photocopying facilities are not available at St Aldhelm’s Church & Centre on the day of the Music Festival. d) All performers will receive a Certificate and a copy of the Adjudicator’s notes and comments on their performance. In addition there are trophies for the most promising performers in certain classes. All entrants must bring their own music stands. The Press may attend the Festival and Festival Concert. Their photographs may be published. If parents do not wish their children to photographed, then the responsible adult with the young person must ensure that they are not included. No photography or video recording is allowed during any performance. Anyone wishing to discuss this must contact the Secretary in advance of the Festival day – contact details above, under “entries”. Light refreshments only will be available for purchase on the day. You are permitted to bring your own food in but no food or drink will be allowed in the Performance areas apart from bottled water for the performers. a) The Festival will be staffed by members of the committee and volunteer stewards, identified by badges. Any instructions from them should be carried out to ensure the safety and enjoyment of entrants and families alike. b) Car parking will be available on the day at St Aldhelm’s Church and on surrounding streets. Please park responsibly. c) The Festival is proud of the diversity of its entrants. Please advise us before the Festival if you have any specific needs so that we can make your day as problem-free as possible. d) The Music Festival accepts no responsibility for loss of belongings, damage to personal property or injury during the Festival. In the event of an emergency the stewards will direct you to the nearest Emergency exit, if this occurs please make your way as quickly as possible to the main car park. Performers who have been chosen to perform in the Festival Concert on Friday 8th March 2019 at 7pm, will be contacted by the Monday after the Festival. The adjudicators advise on the selection of performers and the Committee tries to achieve a varied and balanced programme. The decision of the Committee on this matter is final.